This is my last week as a guest designer for the color challenge on SCS and I must say that I have enjoyed it tremendously! This has been my first dabbling in DT work and being faithful in this small commitment has led to other opportunities for design work with Sweet n' Sassy Stamps. I am thrilled at the doors that are opening up to me at just the perfect time in my life. God is so good! Inspirational Nugget: A perfect example of faithfulness can be found in God, our heavenly Father, because He is always faithful to those who love Him! "Know therefore that the Lord your God, the faithful God, who keeps His covenant and His lovingkindness to a thousandth generation with those who love Him and keep His commandments..." (Deuteronomy 7:9) "The Lord's lovingkindnesses indeed never cease, For His compassions never fail. They are new every morning; Great is thy faithfulness." (Lamentations 3:22-23) I'm so thankful we can begin each new day with God's mercy. What an awesome God we serve! Creative Nugget: Joanne chose Soft Suede, Melon Mambo, Crumb Cake, and Vanilla as the neutral for CC329 this week. The dessert option was to incorporate butterflies. I chose this beautiful butterfly image from ODBD for my card sample. The image is colored with Copic markers. A matching butterfly impression plate from ODBD was used on the Melon Mambo strip behind the image, but it is difficult to see in the photo. The berries have a dab of Glossy Accents and pearls were added to the border punch. 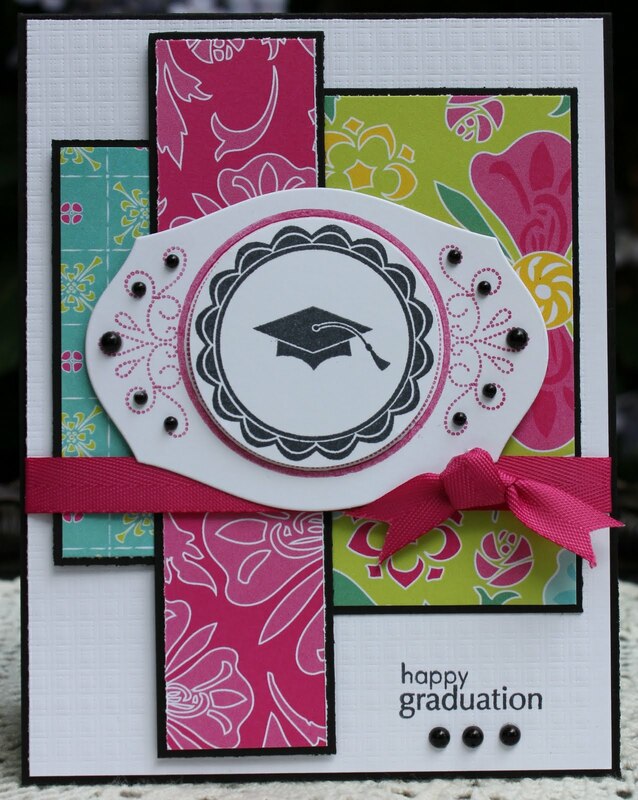 A bit of lace and ribbon finish off the card. I loved working with these warm colors and like how the card turned out...hope you get some inspiration from this sample! 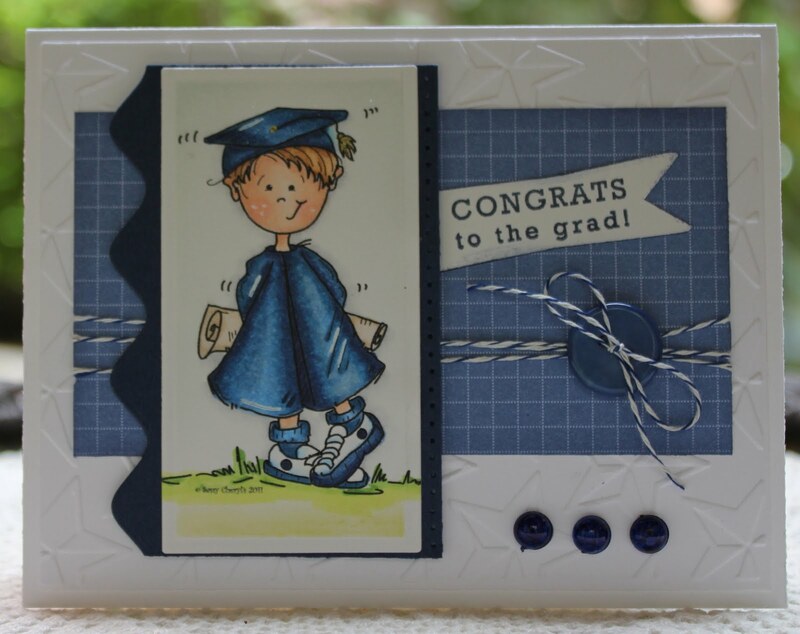 For my second card I used the Sweet Stop Sketch for this week along with the same challenge colors of Soft Suede, Melon Mambo, Crumb Cake, and Vanilla...this time without the dessert option. 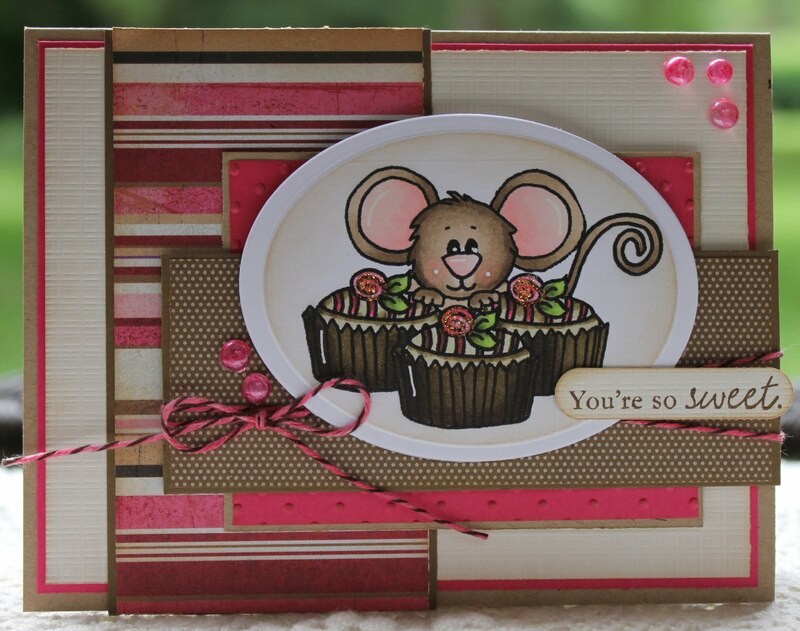 This Cocoa digi image from Sweet 'n Sassy Stamps is so adorable. He can't possibly eat all that chocolate himself...I may just need to help him! This image was colored with Copic Markers as was the Baker's twine and the dew drops. Here's a golden nugget: I used to think I needed all the accessories in every color...now I usually buy just the white or cream and color everything with my Copics! I can usually get a perfect match every time! Thanks for stopping by...and keep the faith! 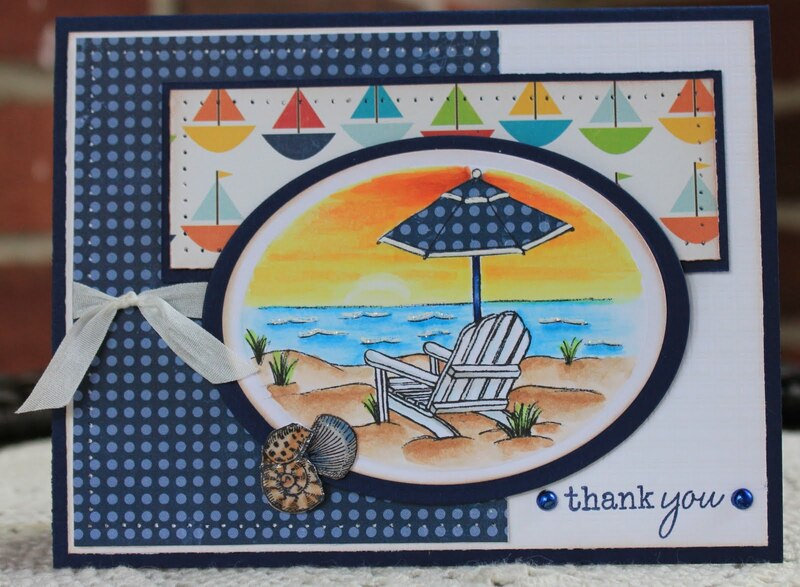 Betty has chosen some wonderful colors for CC328 this week at Splitcoaststampers. We are to use Cherry Cobbler (my favorite red), Night of Navy, Crumb Cake, and neutrals of choice. The dessert option is to use something from the kitchen. Check out the fantastic samples and come join in the fun. These colors just screamed patriotic to me which led me to think about and pray for our nation. 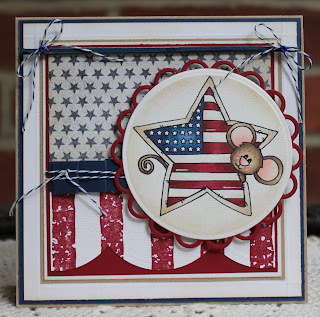 Creative Nugget: I just had to use my new Patriotic Cocoa digi image from Sweet 'n Sassy Stamps for these colors. The image was printed on Cryogen White card stock and colored with Copic Markers. I love the way this card stock shimmers and it is great to use with Copics. 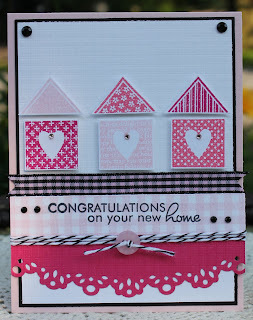 The banner was made by stamping the stripes from an old retired Stampin' Up! set called "Old Glory," DP from the Paper Loft, and a little paper pleating. For the kitchen dessert option, I cut a wooden skewer to fit the banner, sanded the ends, and colored it with a Prussian Blue marker. 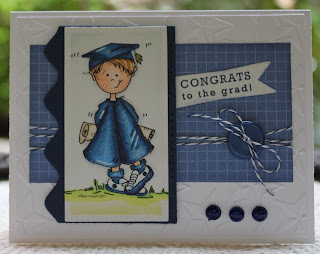 All layers were then overstamped with the Canvas background stamp using Antique Linen Distress ink. I'll also be submitting this card for the Sweet 'n Sassy Digi Challenge, All About Summer, since it has a summer theme and the Cocoa image was a download. If you are a praying person...pray for America today...and thanks for stopping by! "Friend! How sacred the word. Born in the heart of God, and given to man as a treasure from the eternities~no word in the languages so heavily freighted with meaning." ~Cyrus B. Nubbaum~ I count it a blessing to to have quite a few true friends. Inspirational Nugget: There is truth to the saying that to have a friend, you must be a friend. It seems today that many are so easily offended. Years of friendship are destroyed by a single slip. We forget that we are not as perfect as we expect others to be. To have a friend means to overlook, forbear, forgive, esteem highly, deny ourselves, and serve...to love. As we do this, we will gain a true friend, one who will stick with us through the good times and the trials of this life. "The man of many friends [a friend of all the world] will prove himself a bad friend, but there is a friend who sticks closer than a brother." (Proverbs 18:24) True friends are treasures that enrich our lives and bring comfort and relief. Jesus is a friend to all believers and He sticks closer than a brother. "Greater love has no one than this, that one lay down his life for his friends." (John 15:13) That is what Jesus did for you and for me! Now that's a true friend! Creative Nugget: The Free 4 All challenge at SCS today was to CASE a friend, and the Sweet 'n Sassy Digital Challenge was "All About Summer." LeAnne Pugliese was the first friend at SCS that I got to meet in person. 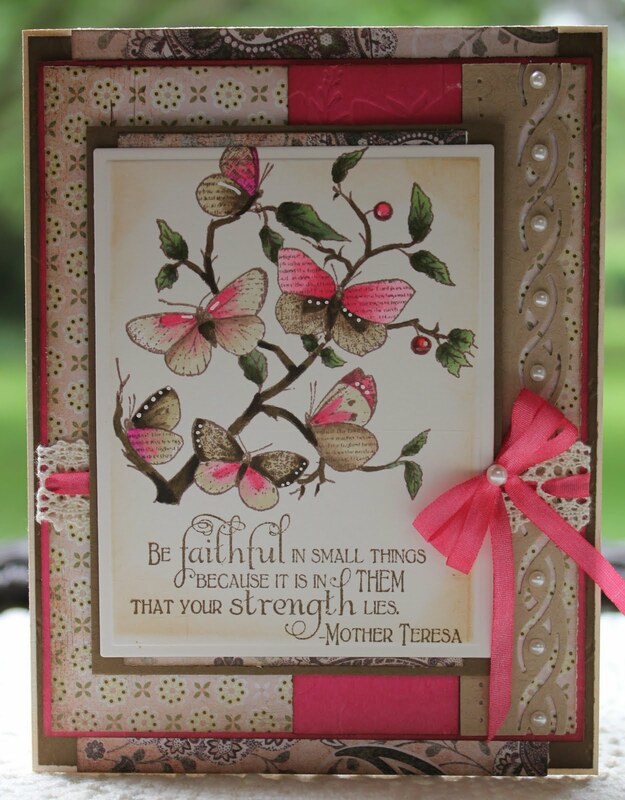 Through her friendship, I have met many wonderful stampers, kindred spirits, from PA. LeAnne's gallery is full of fabulous inspiration, but I chose her Mother's Day card to CASE. 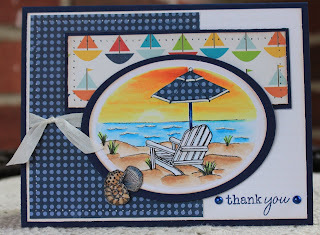 I changed the theme of the card and the colors, but kept the same design elements on my "Thanks From Paradise" card. The image is colored with Copic Markers. The whitecaps on the waves were highlighted with a white gel pen and given a layer of Diamond Stickles. The umbrella was paper pieced and the shells were given a heavy coat of Glossy Accents. The DP panels were pierced and the white panel was given some texture with the canvas impression plate...my absolute favorite way to add texture! Wouldn't it be wonderful to meet here, my friends, for a relaxing day of fun in the sun! Thanks for your friendship, LeAnne, and thank you for stopping by! My husband and I were invited to a double graduation party on Sunday...the brother had graduated from high school and the sister from college. That means I had two cards to make so I turned to the featured stamper challenge at Splitcoaststampers. Inspirational Nugget: Having recently retired from teaching after thirty-five years, I got to thinking how much these two graduating, young adults and I have in common. All three of us are embarking on a new phase in our lives...leaving the comfortable past and pressing on to new endeavors. All three are trusting that the Lord will lead and guide us so that our future years will be as enriched and rewarding as the years we are leaving behind. Listen to these encouraging words from the Bible. "Trust in the Lord with all your heart, And do not lean on your own understanding. In all your ways acknowledge Him, And He will make your paths straight." (Proverbs 3:6) "For I know the plans that I have for you,' declares the Lord, 'plans for welfare and not for calamity to give you a future and a hope." (Jeremiah 29:11) Maybe you are in the same position, and your life is changing for one reason or another. Fear not...trust the Lord and enjoy the ride. Creative Nugget: Mary Brown, Stamper Camper on SCS, is the featured stamper this week. Just take a look at her awesome gallery. 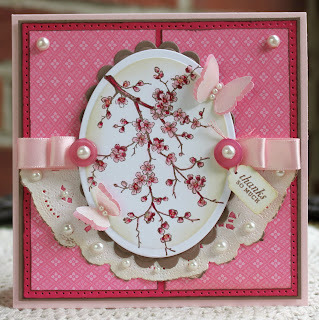 Her Fabulous Florets inspired this card. I kept the layout the same, but changed the stamps and the colors. The grad's school colors were navy and white so I went with that color palette. I have a button where the beautiful bow is and changed the placement of the sentiment. The image was colored with Copic Markers. The dew drops were also colored with a Copic Marker. My second card was inspired by Mary's Love & Care. I kept the layout the same and changed the stamps and the colors. I didn't know the grad's school colors, so I went totally girly for this one. I used a paper strip instead of ribbon and added a ribbon knot and pearls. Wa-La...two grad cards done! Thanks, Mary! Enjoy your day...thanks for stopping by! What a surprise and an honor to have been asked to be a Guest DT member for the SCS Color Challenge for the month of June. This is an answer to prayer and comes at the perfect time since I will be retired as of June 10th after teaching in the primary grades for thirty-five years...that's in just five days! I am in the process of filling out report cards for the last time! Hallelujah! Inspirational Nugget: God is so good, and His timing is perfect. Psalm 37:4-5, one of my favorite scriptures, says, "Delight yourself in the Lord; And He will give you the desires of your heart. Commit your way to the Lord, Trust also in Him, and He will do it." I don't think this is saying that whatever we want, God will give us, but rather, as we seek Him, he will cause us to desire those things that He wants for us according to His perfect will for our lives. He will grant us those things because it is what He wanted for us all along. Praise the Lord! He is so faithful even when we are not! 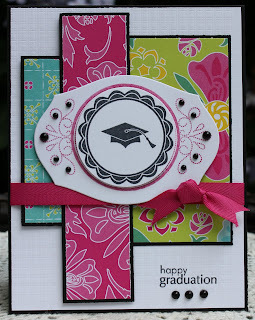 Creative Nugget: This is my first card as a Guest DT member for the SCS Color Challenge. The colors this week for CC326 are Pink Pirouette, Melon Mambo, and Regal Rose. Pearls and buttons were used to satisfy the dessert option which was to use a round embellishment. The image was stamped and colored with Copics. A bit of Diamond Stickles was added to the centers of the blossoms. The DP was from a retired SU! paper pad. Half a doily, buttons, and butterflies punched from DP and covered with some printed vellum were added to finish the card. 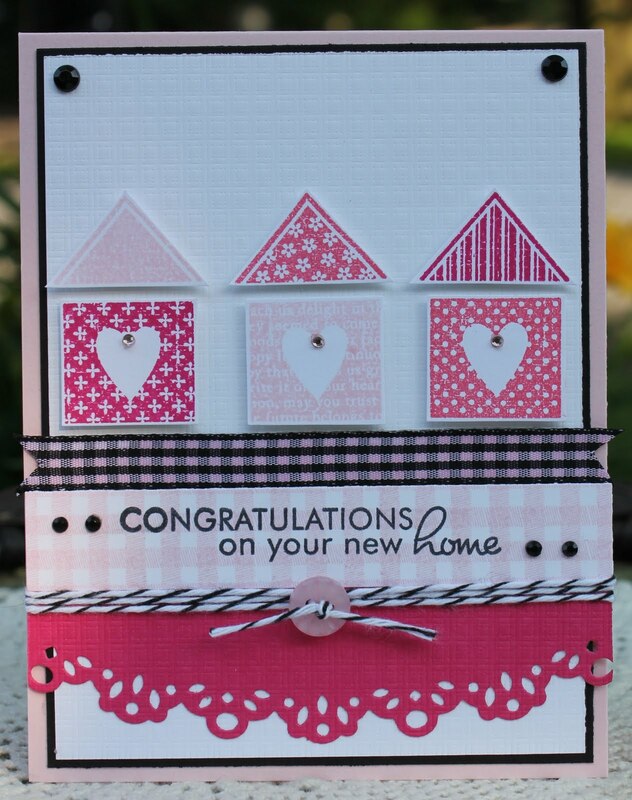 My second card was made for the new neighbors who just moved in across the street. These adorable houses from a PTI set called "Love Lives Here," were cut out and popped up on the canvas textured white panel. Rhinestones and a button were added for the dessert option. The black gingham ribbon was colored with a RV11 Copic Marker. I hope you've been inspired today...thanks for stopping by!